“Do you mind that I’m going to be writing a book about the fact that I was hungry?” I asked my mother. “Just tell a good story,” she replied. Hunger comes in many forms. 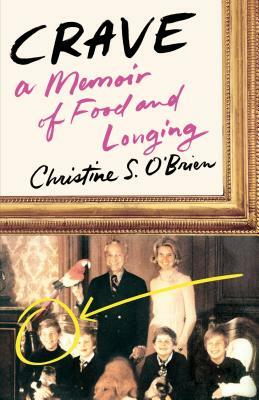 In her memoir, Crave, Christine S. O’Brien tells a story of family turmoil and incessant hunger hidden behind the luxury and privilege of New York’s famed Dakota apartment building. Her explosively angry father was ABC Executive Ed Scherick, the successful television and film producer who created shows and films like ABC’s Wide World of Sports and The Stepford Wives. Raised on farm in the Midwest, her calm, beautiful mother Carol narrowly survived a dramatic accident when she was child. There was no hint of instability in her life until one day she collapsed in the family’s apartment and spent the next year in bed. “Your mother’s illness is not physical,” Christine’s father tells her. Craving a cure for a malady that the doctors said had no physical basis, Carol resorted to increasingly bizarre nutritional diets—from raw liver to fresh yeast—before beginning a rigid dietary regime known as “The Program.” It consisted largely of celery juice and blended salads—a forerunner of today’s smoothie. Determined to preserve the health of her family, Carol insisted that they follow The Program. Despite their constant hunger, Christine and her three younger brothers loyally followed their mother’s eating plan, even as their father’s rage grew and grew. The more their father screamed, the more their mother’s very survival seemed to depend on their total adherence to The Program. This well-meant tyranny of the dinner table led Christine to her own cravings for family, for food, and for the words to tell the story of her hunger. Crave is the chronicle of Christine’s painful and ultimately satisfying awakening. And, just as her mother asked, it’s a good story. Christine S. O’Brien earned a BA in English at UC Berkeley and holds a Double MFA from Saint Mary’s College in Nonfiction and Fiction, where she was awarded Saint Mary’s Agnes Butler Scholarship for Literary Excellence. Her essays and short stories have appeared in The Seneca Review and The Slush Pile Magazine, and her work received an Honorable Mention in Glimmer Train’s Short Story Award for New Writers. O’Brien has worked for ABC-TV, Alex Ponti, and NBC Productions. She is currently a part-time lecturer in the English Composition Department at Saint Mary’s College and lives in Walnut Creek, California, with her husband and two children. Crave is her first book.